As this is a ‘work in progress’ some of the links will take you to pages that are still ‘under construction’, this is especially true of the more specific ‘action’ links of which nine are now complete. The remaining two, Salaita and Latema-Reata Nek, are still to be started. The more general ‘year’ links, 1915 to 1918, are complete and I hope to add more detail to the ‘action’ links as and when time permits. When the 25th (Service) Battalion Royal Fusiliers (Frontiersmen) entered the East African theatre of war on 4th May 1915 they became the second and last ‘white’ British infantry battalion to do so and joined what was to become a very heterogeneous force which would include Indian, Rhodesian, South, East and West African and West Indian infantry battalions. 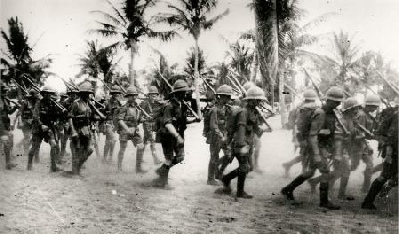 With the shortage of manpower in East Africa on the battalion’s arrival it was perhaps no surprise that its operational establishment never matched its ‘paper strength’ as men were initially taken from the battalion to perform other duties and then, later on, the ravages of disease and sickness would reduce the battalion’s effectiveness as the tropical climate began to take its toll. I believe it is correct to say that at no time after its arrival in theatre did the battalion go into action with any more than half the notional battalion strength and towards the end of their campaign with significantly less than that. Despite this the battalion made a not insignificant contribution to the war effort in the East African theatre and it is this contribution that I am attempting to provide a record of through the links on this page. I am not a military strategist, the details recorded are my interpretation of events based on sources available and I apologize in advance if I have interpreted anything wrong, any mistakes are solely mine.